Los Angeles, California (The Hollywood Times) 2/5/2019 – “My hope is that you can watch a film like this and look at LA in a different way. To step back and look at it as a garden paradise and then realize that the miracle of LA is the 12-month growing season and the incredible ground that is here. We have the opportunity to reconnect with the earth and with the ground and remember that our food comes out of the ground and not the supermarket. It’s a wonderful thing to remember. ” Raphael Sbarge, Executive Producer of LA Foodways told The Hollywood Times. L.A. was the largest agricultural center in the country up until about 1950. Before it was known as the epicenter of celebrity culture, Los Angeles was a farm town – and not just any old farm town. THT: Tell us a little about the upcoming screening of your latest documentary LA Foodways. THT: What is the deal about Food Forward and backyard fruit trees? THT: Did you do your own research for this documentary? THT: Is this going to be a series? THT: How can our readers volunteer for these organizations? Raphael: “One is Seeds of Hope; WLCAC in Watts, lots of opportunity to help out there; Solutions for Urban Agriculture, all of these organizations have incredible opportunities to get involved. THT: How are you feeling now that the screening is here? Everyone reading this article should reach out to foodward to donate their fruit on the trees in their backyard. LA FOODWAYS examines the history of food in Los Angeles. This documentary from filmmaker/actor Raphael Sbarge (A Concrete River; Reviving the Waters of Los Angeles) and KCET looks at the storied agricultural history of Los Angeles to understand present food waste challenges and opportunities to bring fresh foods to urban communities. From the importance of orange crops in the 19th century to the massive scale of food waste in the U.S., the film is a deep dive into the different manners in which local organizations are coming together to ensure the future of agriculture in the region in order to identify environmentally friendly solutions for the future. Food Forward and five of the local food organizations featured in the series are co-hosting this special premiere screening of the film, followed by a panel discussion. Actor Tony Amendola (Annabelle, Once Upon a Time), Vivian Bang (Swedish Dicks), Actor James Ksyon (Heroes) Actor Jonathan Chase (Gamer) Actor Mateus Ward (Murder in the First) and Host Rosey Alvero (KCET’s SOCAL WANDERER). THT: What have you been working on? THT: What brings you out tonight? THT: Have you seen the film yet? Celeste: “No I haven’t. I’m look forward to it”. THT: Are you an environmental activist? THT: Do you garden at all? THT: What are you currently working on? THT: What brings you out here tonight? THT: Is some of his environmental knowledge rubbing off on you? THT: Did you know that LA used to be a large agriculture land. THT: You were really great in the film. THT: Tell us about your organizations. THT: How can our readers volunteer? Lakisha May (Food advocate and actor/writer/producer) started off the panel discussion after Raphael’s wonderful documentary. It was a great Q&A with the panelists and then the Q&A was open to the audience. In each episode, we use the past to frame where we are today, to understand the food we grow and the land beneath our feet. We span 150 years of change, from 1870 to the present, focusing on the land in and around Los Angeles, how it has been used and developed into either farms, freeways or front lawns. Over the course of these stories, with this historic view of the change that has come before us, we gain a greater understanding of what Los Angeles is today and invite viewers to consider the future. 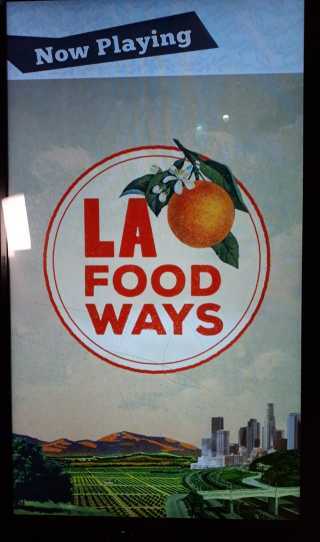 LA Foodways is a documentary exploring LA’s past, present and future as a food producing center. This episode looks at how issues of food waste are being addressed in Los Angeles today. On-air, online, and in the community, KCET plays a vital role in the cultural and educational enrichment of Southern and Central California. In addition to broadcasting the finest programs from around the world, KCET produces and distributes award-winning local programs that explore the people, places and topics that are relevant to our region. Whether it is through our broadcast, via cable, over digital platforms and devices, or from our extensive community outreach and education programs, KCET consistently delivers inspiring global content that informs, educates and enlightens millions of individuals in Southern and Central California. Nearly two million viewers watch KCETLink’s primary channel, KCET in the average month month in 11 Counties across Southern California: from as far north as San Luis Obispo, as far south to San Diego and as far east to the Nevada / Arizona border.